Augustine of Hippo lived from 354 to 430, and was an early Christian theologian and philosopher whose writings influenced the development of Western Christianity and Western philosophy. He was the bishop of Hippo Regius. He is viewed as one of the most important Church Fathers in Western Christianity for his writings in the Patristic Era. Among his most important works are City of God and Confessions. In the Catholic Church and the Anglican Communion, he is a saint, a preeminent Doctor of the Church, and the patron of the Augustinians. His memorial is celebrated on 28 August, the day of his death. He is the patron saint of brewers, printers, theologians, the alleviation of sore eyes, and a number of cities and dioceses. Many Protestants, especially Calvinists, consider him to be one of the theological fathers of the Protestant Reformation due to his teachings on salvation and divine grace. In the summer of 386, at the age of 31, after having heard and been inspired and moved by the story of Ponticianus’s and his friends’ first reading of the life of Saint Anthony of the Desert, Augustine converted to Christianity. 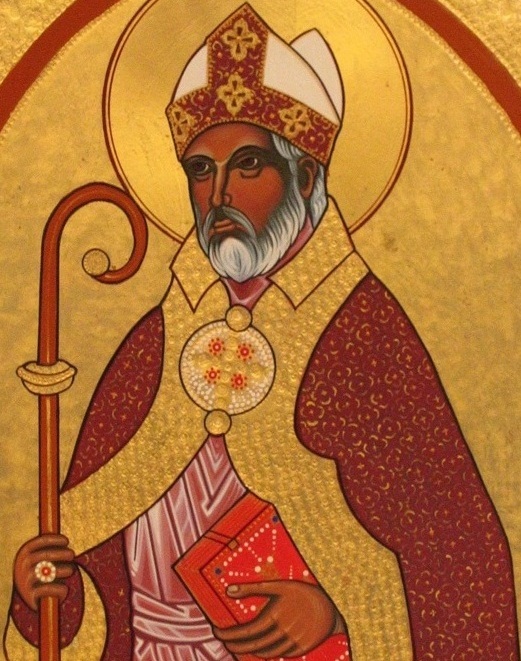 As Augustine later told it, his conversion was prompted by a childlike voice he heard telling him to “take up and read” which he took as a divine command to open the Bible and read the first thing he saw. Augustine read from Paul’s Epistle to the Romans – the so-called “Transformation of Believers” section, consisting of chapters 12 through 15 – wherein Paul outlines how the Gospel transforms believers, and the believers’ resulting behavior. In 391 Augustine was ordained a priest and became a famous preacher (more than 350 preserved sermons are believed to be authentic), and was noted for combating the Manichaean religion, to which he had formerly adhered. Shortly before Augustine’s death the Vandals, a Germanic tribe that had converted to Arianism, invaded Roman Africa. The Vandals besieged Hippo in the spring of 430, when Augustine entered his final illness. According to Possidius, one of the few miracles attributed to Augustine, the healing of an ill man, took place during the siege. According to Possidius, Augustine spent his final days in prayer and repentance, requesting that the penitential Psalms of David be hung on his walls so that he could read them. He directed that the library of the church in Hippo and all the books therein should be carefully preserved. He died on 28 August 430. Shortly after his death, the Vandals lifted the siege of Hippo, but they returned not long thereafter and burned the city. They destroyed all of it but Augustine’s cathedral and library, which they left untouched. Augustine was canonized by popular acclaim, and later recognized as a Doctor of the Church in 1298 by Pope Boniface VIII. His feast day is 28 August, the day on which he died. His prominence as a Doctor of the Church is mostly due to the many topics in which he took a theological stance. Here is a list of key topics: Creation, ecclesiology, eschatology, just war, Mariology, natural knowledge and biblical interpretation, original sin, free will, sacramental theology, and views on sexuality. The familiar image of an angel and the devil sitting on a person’s shoulders has been shown in movies and television many times. An angel and the devil have not literally sat on my shoulders, but I can identify with that image. A thought of wanting to do something that may not be the best idea comes to my mind… I think about it, and I hear the devil say to me something like, “Life’s short, do it!” Then look over at the angel which is waving its finger at me and saying, “Oh no! You know better than that!! !” I eventually weigh the consequences of both actions, and 99% of the time I do the right thing because I know what is responsible and right. The readings for today speak to the subject of responsibility and doing what is right. Paul is instructing the Thessalonians on how to live according to how God intends humanity to live if they truly are to follow the teachings of Jesus. Following Jesus means letting go of any immoral behavior. The parable which Jesus tells is about being responsible enough to take time to be prepared, knowing that negative consequences will result if one is not prepared. This preparedness is about living a life in which one desires to follow God instead of going astray. We know that God loves us unconditionally, but it is our responsibility to live according to his commandments and teachings given to us through Jesus. We cannot allow the devil sitting on our left shoulder tell us it is okay to do things which we know are not of God. When the angel is saying, “You know better!” we need to listen to the angel. How do we do the right thing? We do not put ourselves in a position which presents the opportunity for the devil to convince us that it is okay to do something; we spend time around positive and responsible people, we take time to read Scripture, we pray, we recognize our vices in life and stay away from them. Are you doing the right thing?